Yay! Another WIP off the needles and blocked! I was hoping to get this done sooner, but alas being sick didn't allow for me to get much done. Once I was up to the task of actually doing some knitting, this project was the first to grab my attention. Like most shawl patterns, this one started out really fast and then towards the end one row seem to take forever to complete. The last few inches were totally tedious and the bind off was even more time consuming, but the results are fantastic and I absolutely LOVE this shawl! Before I had the chance to block it I was already wearing it around the house. The Shibui Baby Alpaca is simply to die for! It is soo incredibly soft and not once did I find it itchy. This yarn seriously feels like butter! I've never knit anything by Shibui before so this yarn was definitely a great intro. As for the pattern, it's pretty straight forward and quite the easy knit. After a while I didn't even need all the stitch markers the designer called for, as you can pretty much tell when you need to start knitting or purling a section. I did however, keep the stitch markers for the centers of each panel where you are to increase stitches, just so that I knew when to do so in case I got distracted while knitting...which is quite often. I have to admit, even though this was an easy knit, towards the end, in my haste to get this finished, I did drop a stitch. Luckily I had noticed this a row into the hem. Unfortunately the dropped stitch was about 13 rows ago. The good thing was that I was somewhat brave enough and utterly delirious with the idea of having a finished object that I willingly pulled apart the knitting along that dropped stitch so that I could "ladder" back up and act like nothing was dropped at all. Phew! Glad it worked out! There is a part in the pattern that is a bit confusing, but it's more of a designer's note/preference than an actual design piece. That part is the edging and how to make it not so loose and sloppy looking. After much investigating on Ravelry I didn't really get much help as to how to do what Stephen West suggested, or if it made a huge difference in how the shawl ends up looking. I was then told that it didn't make a difference, but after doing the yarn overs the way I normally do, I did notice that the edge was getting too separated from the rest of the piece. So I started doing what I thought Mr. West wanted you to do, and lo and behold, it was right! I was too lazy and impatient to rip the shawl back to square one, so there is a tiny section of the shawl that shows the edge looking a bit hole-y. I was hoping that blocking would fix all of that up. But then I realized that no one would notice anyways, since that spot would be hidden when worn. 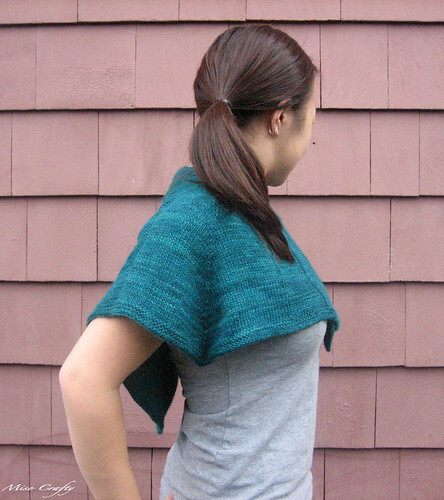 I would love to knit another, but I have way too many shawl patterns in my queue (what else is new??) to do so. 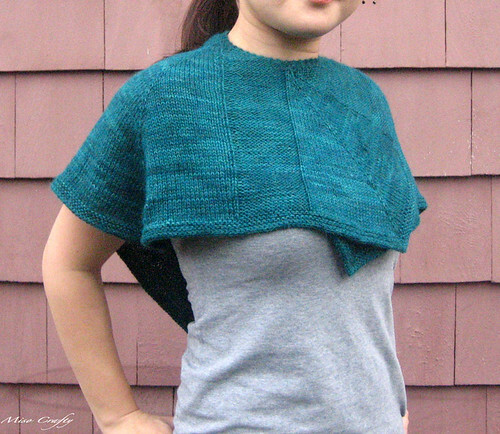 But I do recommend this pattern to anyone who wants an easy and quick knit. I think this would be a wonderful Christmas gift, unfortunately I don't know anyone worthy of hand-knits or would be willing to hand-wash an accessory. 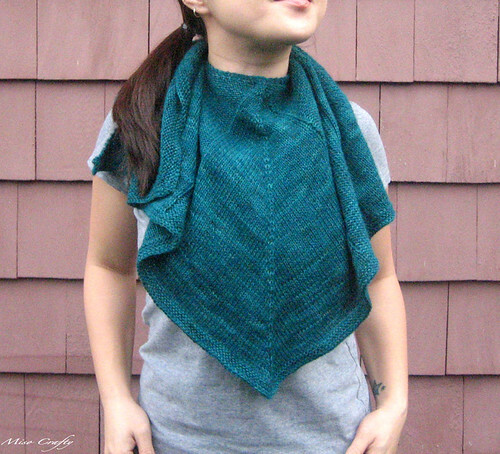 This shawl was also super easy to block. It took me less than 10 minutes to lay it out, minus the soaking time, but then again I was using my brand new blocking wires for the first time so I could have been giddy with excitement. 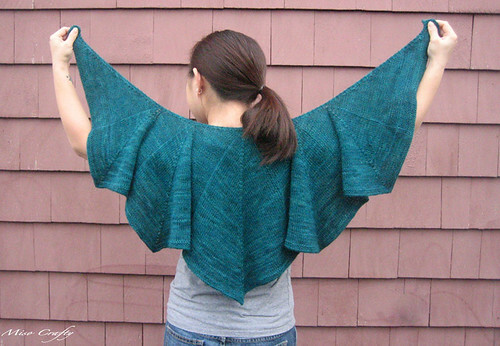 Those blocking wires definitely make me want to knit up another shawl. Yes, I'm a dork! Gorgeous! I love the color. Thanks so much! I can't get enough of this colour! !